If you’re looking for a jam recipe without any added refined sugar, look no further! 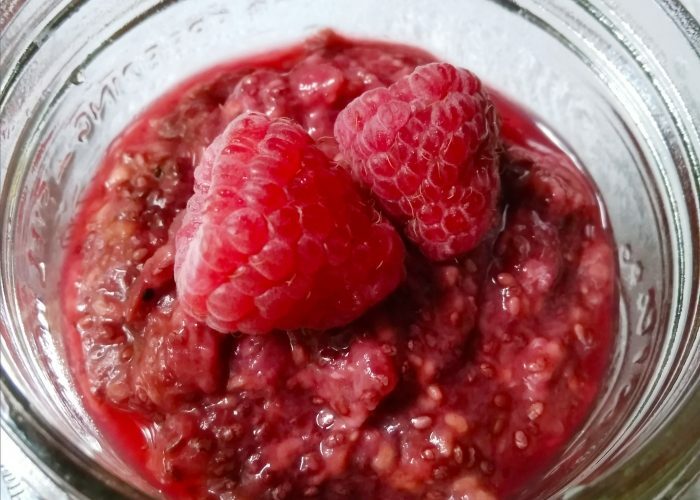 Try this super easy and quick to make Raspberry Date Jam recipe which uses only 4 ingredients. The key ingredient to add to its sweetness? Dates! Packed with chia seeds as a gelling agent and for an extra nutritional boost, this yummy plant-based, egg-free, dairy-free, oil-free, gluten-free and nut-free spread will go well on nut or seed butter and jam sandwiches, crackers, cakes, muffin tops, on pancakes, waffles, vegan ice-creams or even between sandwich cookies. Feel free to double this recipe if you would like to make a larger quantity at one go! An easy and quick to make sweet vegan, egg-free, dairy-free, oil-free and gluten-free jam spread that’s a healthier alternative for you and your family than store-bought jams. Make this jam and then use it as a spread on virtually anything you can think of! Place 6 pitted dates in a bowl of very hot water (i.e., just boiled) to soak for 5 minutes. Add the date puree, chia seeds and water into the pot. Mix the pot contents with a spoon until well combined. Continue heating the pot contents on a medium heat setting for 3-4 minutes until the mixture in the pot starts to thicken slightly. Taste and if you would like the jam to be sweeter, you can add in a teaspoon of a sweetener of your choice (e.g., maple syrup, agave nectar or honey). Transfer this mixture into a glass mason jar, and store in the refrigerator until a jam texture is formed (you may not have to wait very long). Start using and enjoying! If you want no added sugars to this recipe, simply do not add in any maple syrup (or agave nectar or honey). However, if you would still like the jam to be slightly sweeter, you can increase the amount of soaked dates used in this recipe (e.g., use 8 pitted dates instead of 6). Another option is to use a freshly squeezed or 100 percent juice product like apple juice to substitute the water used in this recipe. This jam will keep well refrigerated for at least a week. Freeze what you won’t use immediately in a lidded jar or freezer safe container to thaw and use at a later date as desired. This is such a delicious and healthy jam ! Thanks for sharing!